Today the Holy Church marks the day of the Protection of the All-Holy Theotokos. This is essentially a Russian celebration, but happens in a very few parished of other Orthodox Churches. Most of you know that this feast arose in Greece, in Constantinople. In the Blachernae temple, St.Andrew the Fool-for-Christ, an well-known ascetic in Constantinople at that time, beheld the Mother of God during the Divine Services standing standing above all the faithful, holding her Protection above them, her archiepiscopal omophorion, invisible protecting each worshipper, each one who was in the church, striving whole-heartedly toward God. Only two people saw this spiritual vision: Andrew the Fool-for-Christ and his disciple. The rest continued praying as before. They stood reverently, paying attention to the words of the prayers. 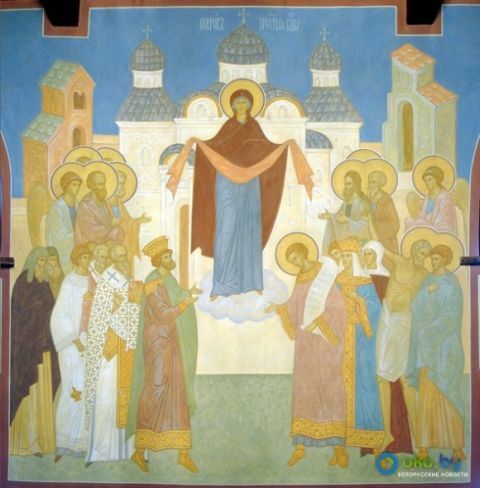 But what a difference there is between those two, who saw the Holy Theotokos, and us who stand with faith in church while faith raises our souls up to God? In each of our lives there have been supernatural occurences, one or several, which indubitably confirmed for us the existence of the of the spiritual world, that the Lord God, whose nature is inconveivable, the Ruler and Master of the world, directs all the fates of men, and he leads a man from this life, from temporal life, to eternal life. Before Him each of us must give an account for the way we have spent our lives, for each deed and for every thought which we have made and brought to fruition in this world. And there is indeed a great difference between the ascetics, chosen ones of God, who like in the reality of the spiritual world, and us, who only from time to time are made worthy of special revelations, special visions. What is this mystery, and in what does our unworthiness and insufficiency consist? We have come today to the temple of God in order to offer Him the sacrifice of repentance, prayer, and candles. What more can a man give to God? In general, the relationship between God and man takes place only on the level of sacrifice. Here in our temple there is an altar to God, whereon God Himself offers Himself in sacrifice to us. He offers all of Himself, just as the great sacrifice was offered on Golgotha, when the Lord Jesus Christ lowered Himself, Divinity lowered itself to the level of mankind and offered itself entirely in sacrifice out of love for us, in order that He might raise us up from a condition of death to one of eternal life, whereunto we are all called. We all know about the sacrifice of Christ, and we all live by this sacrifice. But God also awaits a sacrifice from us. The only sacrifice that is a true gift and a true sign of love is that which is important and dear to us that we give up from ourselves to someone else. Contemporary man, unfortunately, is not, as rule, prepared for sacrifice. We have no decisiveness to cut our from ourselves our habits that run contrary to the commandments of Christ, that get in the way of divine communion, and which are empty or harmful for us, being very dear to our passions. And these weaknesses, sicknesses, sins, habits, and (most importantly) our laziness, we are unable to offer in sacrifice to God by cutting them out from ourselves. But this is the only thing that God is waiting for. Observe how people come to church and, in the first years they have a wondrous and fruitful spiritual life, when they come to know God, come to the Church and begin to live a new life. Why? Because, of course, their first zeal has given them the strength to offer their former habits and attachments in sacrifice to God, and God in return has given them wondrous grace and spiritual power, wonderful forsight and communion with God. But then, when he comes back to a normal state, to every day life, then a new sacrifice is required from us. But we offer it with greater and greater difficulty and this causes the life of the Christian to bear little fruit, and to become more and more tiresome. He understands intuitively and by the experience of his previous life that this is the right path, but he is unable to renounce that which he knows it necessary to renounce. He understands that it is necessary to offer these weaknesses and laziness to God in sacrifice, and then to begin again a strong and renewed spiritual life, but Orthodox Christians make such a step with great difficulty. It is the now the case that, even until his death, a man abides in a divided state, having not the power to step over his own pride, over his own predilection for ease and pleasure which, it would seem, are not sinful in themselves … But in order to enter a new spiritual state, in order to excise one’s passions, such a sacrifice is entirely necessary. Andrew the Fool-for-Christ was just such a man, who sanctified his entire life by the greatest method and, as the Holy Fathers write, by the science of sciences, which is Divine communion. Gradually he excised from himself all that stood between him and God: passions, pride, self-opinion that came from people exalting him. And it was precisely this man who was made worthy of the vision of the All-holy Theotokos. But this was only one of the many visions that he had. Saint Seraphim, the Elders of Optina, the Saints of our time, according to whose spiritual lives we orient ourselves, they lived and now live as a constant sacrifice, offering themselves in sacrifice to God. These words sound terrible to the external man, who still does not know what the love of God is. But if any man thinks about these words — a husband, for example, who brings something that is very important to him as an offering to his spouse — then he will understand that he has enriched himself, inasmuch as he has deeply understood the importance of their relationship. A mother begins to understand this when she offers her hours, days, and strength to her children, giving up her own future; and in this she finds her happiness. Every Christian understands this, who is able to be raised to the state of Divine communion, and in this he find that true happiness which exists on the earth, rather than those things which unhappily come to and end when we pass fro temporal life to eternal life. May the Lord raise us also to this spirit of the Saints, even if only in part. May He grant us to understand the mystery of which the Lord spoke when He said “I desire mercy, and not sacrifice.” May we ascend to that spiritual stature where the sacrifice of God, offered to us ourselves, will be as mercy, as happiness and joy. Very few are capable of this, but each of us is called to it. Amen.